General. The Poortersloge is the most remarkable building on the Jan van Eycksquare. It has a slender tower and its facade is adorned with several statues, under which "het beertje van de loge" (the bear of the loggia). Brief history. The Poortersloge was built at the end of the 14th and beginning of the 15th century in the commercial heart of Bruges. This side of Bruges was the area where the international trade took place, ships were loaded and unloaded. In the immediate vicinity were the nationhouses of the most important trading partners and next door was the toll house, where goods had to cleared and tax was levied. The Poortersloge was the place where the "important" citizens (poorters) had their meetings and where they received their trading partners. 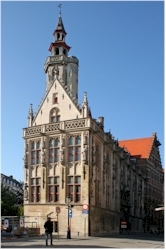 It was also the seat of the "Genootschap van de Witte Beer" (the Society of the White Bear). The statue of the Bear of the Loggia reminds of that society (see the facade at the corner of the Academiestraat). A fire ravaged the building in 1755 after which it was restored, a cartouche in the facade reminds of that incident. It was restored at the end of the 18th century, giving the Poortersloge back its original medieval appearance. From 1720 it served as academy for Fine Arts, from 1912 till 2012 it was used for the National Archives. In 2014 the town of Bruges bought it back from the state.